“I could stand in the middle of Fifth Avenue and shoot somebody and I wouldn’t lose voters,” boasted Donald Trump during his presidential campaign. The Fifth Avenue Principle turned out to be the cruelest but also most insightful summation of the psychology of Trump’s fan base. But, as much as Trump would like to imagine the principle applies uniquely to himself and his cultural magnetism to red America, it has more to do with his adorers than the subject of their adoration. The principle was demonstrated aptly enough by newly elected Republican congressman Greg Gianforte. The incoming representative did not literally stand in the middle of Fifth Avenue (which lies well outside his Montana district) nor did he shoot somebody. 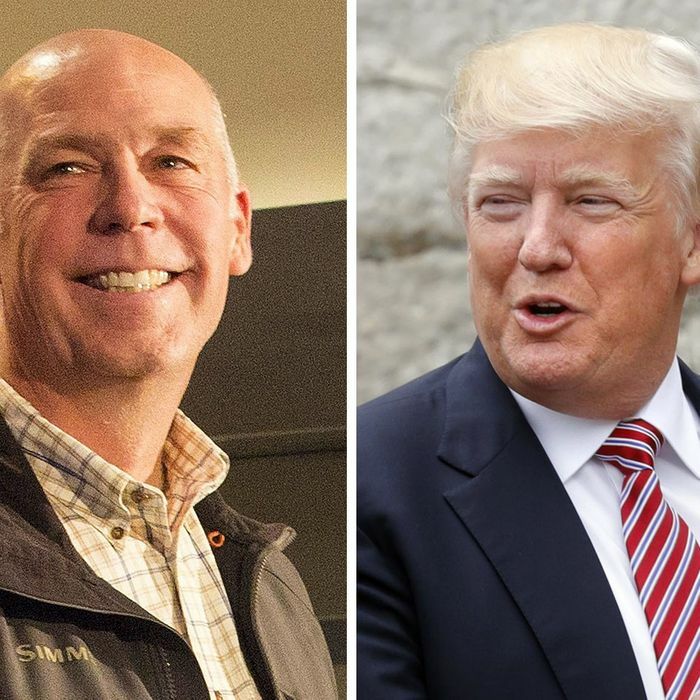 He did, however, make a brutal and unprovoked physical attack on a reporter who merely had the temerity to ask him a pertinent policy question Gianforte preferred to dodge. Gianfonte’s attack was recorded on audio and witnessed by a full crew from — of all places — Fox News. The response to this incident has broken down along almost exactly the same lines as the responses to the various outrages committed by Donald Trump. The mainstream media, liberals, and a handful of conservative pundits have howled. The latter camp overlaps almost entirely with those conservative intellectuals who have criticized Trump. Against those conservatives aghast at a member of Congress acting like Tony Soprano is a much larger and more influential array of party regulars. Fox & Friends covered the story in a perfunctory and misleading fashion. Sinclair News, an up-and-coming conservative propaganda network that controls a wide array of local news stations, blacked out the story altogether. Talk-radio giant Rush Limbaugh swooned over Gianforte’s display of machismo. And evidence suggests the vast majority of the Montana Republican electorate followed the latter. There is an interesting debate over whether, or to what degree, Trump has legitimized political violence or rough treatment of the media. But what Gianforte clearly shows is the willingness of the most powerful elements of the conservative movement to deny or legitimize any misbehavior, however gross, obvious, and unrelated to conservative principle. And the episode offers a road map to how those same people will continue to follow Trump wherever he takes them. The election of a thug is a dry run for the battles that lie ahead in Trump’s Washington.